For caravans & mobil-homes: for install it one year. Plots of 110 m2. 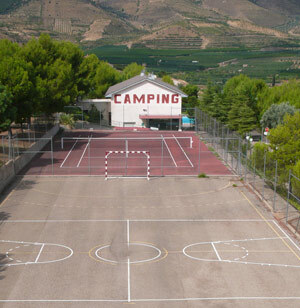 Our campsite has all the services of a 2nd category campsite. We are just seven kilometres from the A2 (km 255 of the Madrid-Barcelona motorway), next to the town of Sabiñán, famous centre for fruit and orchards nestled in the Jalón Valley, surrounded by 1,000m high mountains. The campsite is made up of an area of 45,000 square metres, split up into 100 spacious plots, carefully looked after green areas, other common installations and services. It can accommodate up to 400 pitches. We are open all year round and we have different camping modalities from plots with all the facilities to bungalows to rent. Our installations have green areas with grass and extensive shady zones, swimming pool, sports grounds and playgrounds for kids. The plots are situated in terraces that have been specially adapted to level off the slope of the land, with all the services easily accessible. The campsite caters for caravans and mobile homes throughout the whole year. Pets are allowed.